Instagram is finally getting down to business, as the social network has announced that it is beginning to roll out a suite of business tools for advertisers. According to the company, the business tools will enable advertisers to better understand the performance of both their paid and organic content. It is important to note, however, that Instagram initially launched ads for a handful of brands back in October and the functionality has still been not released to the public. That said, the company notes that these new business tools will be released to more brands later this year, which could mean that ads will be made available to more brands as well. The new business tools will provide brands with account insights that enable businesses to monitor brand awareness on the social network through impression, reach and engagement data. 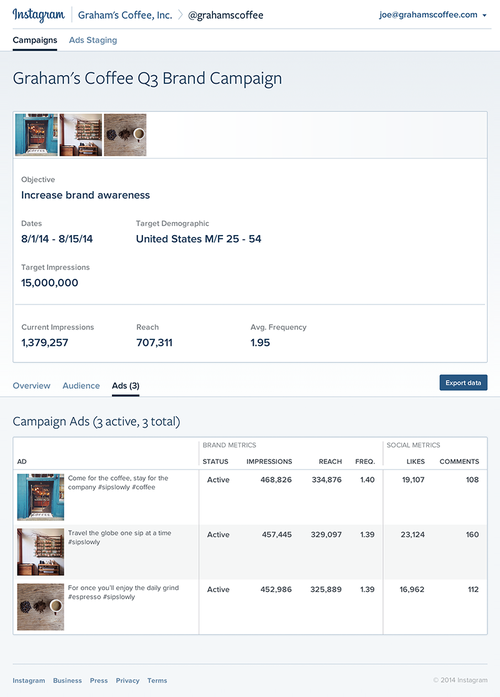 The new offering will also include ad insights that highlight the performance of paid campaigns with analytics for each individual ad. Plus, brands will be able to preview, save and collaborate on ad creative for campaigns through Instagram’s new ad staging tool.